Breckenridge Brewery is no stranger to making unique and delicious beers like their Vanilla Porter and Agave Wheat so when it came time to check out their Christmas seasonal I knew I would be in for a treat and happily I was right. Their Christmas Ale is everything you would expect from a well crafted winter warmer: spicy, strong, sweet, malty backbone with a good hop presence. This holiday beer delivers right on par with good strong malt flavors and spicy hops and dark fruits with a high alcohol content to keep you warm on those chilly freezing winter nights. So a Merry Christmas to all and to all a good a beer! Appearance: The beer pours a beautiful rich mahogany with great clarity. There was very little head (one-finger’s worth) even when poured with vigor. What head did appear was actually quite creamy and left decent lacing when swirled around the glass. Head settles to a film pretty quickly. If the head was a bit more pronounced and the retention better, this would be a picture perfect Christmas beer. Smell: Toasted malt hits the nose first with hints of caramel and dark fruits following close behind. 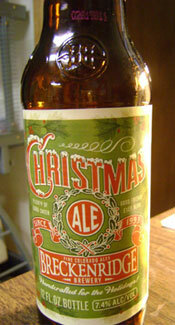 A nice pine-citrus hop scent cuts through the sweetness giving the smell of this Christmas beer a welcomed complexity. Finishes with some nice holiday spices (nutmeg, cloves and vanilla) and a bit of alcohol esters. Smell is somewhat subdued but still very inviting. Initial Taste: The smell carries through into the flavor of this beer perfectly with big flavors of toasted malts, chocolate and caramel creating the sweet backbone for this holiday brew. The sweet flavors are balanced with hops that deliver some welcome citrus and piny bitterness. The finish is subtly sweet with flavors of dark cherries and coffee. Thoughts: Breckenridge Brewery is no stranger to making unique and delicious beers like their Vanilla Porter and Agave Wheat so when it came time to check out their Christmas seasonal I knew I would be in for a treat and happily I was right. Their Christmas Ale is everything you would expect from a well crafted winter warmer: spicy, strong, sweet, malty backbone with a good hop presence. This holiday beer delivers right on par with good strong malt flavors and spicy hops and dark fruits with a high alcohol content to keep you warm on those chilly freezing winter nights. So a Merry Christmas to all and to all a good a beer! Sounds like a nice beer. I didn’t know that Breckenridge and Avery were one in the same? If that’s the case, I might actually be able to find some of this in Jersey! I really enjoy this beer style. Shannon Harrison, September 6, 2012 at 7:28 pm I took my husband here for his 32nd biadhtry, and we had the time of our lives. Yeah, there is only one tour a day during the week, but its a great tour. You learn everything about the brewery, from its founding to how they brew the beer to who Saint Arnold actually is. Then you can enjoy what’s on the tap.My husband had a great time. We will definitely go back there again!